These are just a sampling of the 347 ornaments hand-created by artists whose designs represent America’s national parks, memorials, seashores, historic sites and monuments displayed on the tree in the Blue Room at the White House. 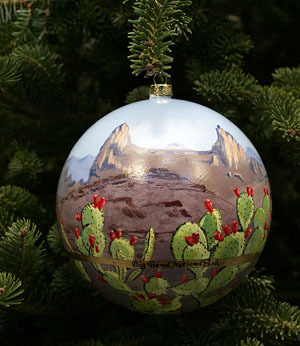 This is the Texas ornament, which doesn’t look all that Texan to me. The only ornaments that are immediately recognizable as belonging to their respective states are California, Montana and New York, However, the Hawaii ornament is WAAAYYY cool and the BEST.